﻿﻿Based on our Nomads format where a score of 28 - 32 points is deemed average, a score of 40 points and more is an exceptional achievement. Here we celebrate the achievement of our members who have scored 40 points or more at monthly games. We have only 11 multiple winners, with Barry Schutte getting four 40 pointers, Jo Landsberg three times and 9 others twice. 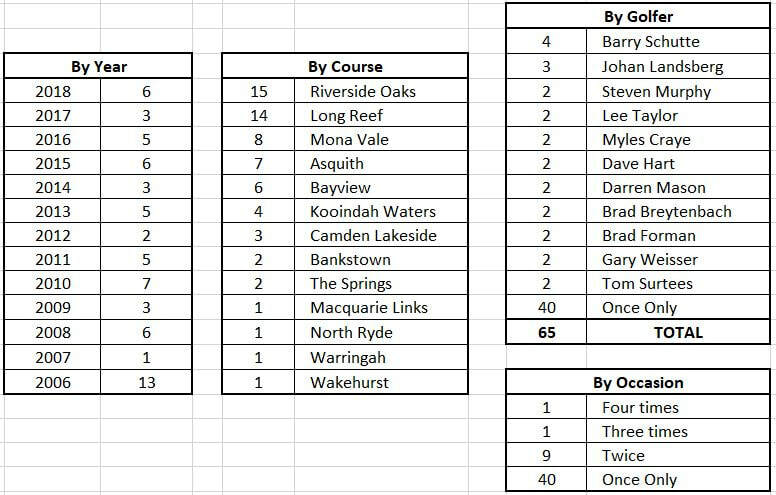 Riverside Oaks (15) and Long Reef (14) would appear to be the easiest but keeping in consideration we play there twice a year. However, the easiest course would have to be Asquith where we have had seven 40 pointers in 7 visits from 2009. The most 40 pointers in one game was Long Reef in 2006 where we had 4 members shoot 40 points or more.